THE Mesa campground in WA's popular Cape Range National Park is now open for campers following a $400,000 upgrade. It is the third campground to undergo a major facelift in the Ningaloo Coast World Heritage area within the past two years and brings the total number of campsites within Cape Range National Park from 109 to 160, with the ability to increase this further to 220 under the current management plan. 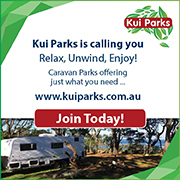 The other campgrounds to benefit were Kurrajong and Osprey. Located in the northern end of the park, the Mesa campground overlooks a small north-facing bay and has been a drawcard for campers for decades. Improvements included the development of a new loop road with 23 hard surfaced camping bays and more than 500 metres of paths, which provide access for all to beaches, day use areas, visitor car parks and toilets. The spacious camping/caravan bays are 8m wide by 12m deep, and the new toilet blocks and picnic tables have been designed using materials suitable for the coastal environment. The area is now serviced by a 300-metre loop road with additional car park bays. The new camp sites have been developed to accommodate camper trailers, campervans, caravans and associated annexes, furniture, accessories and boats. The protection of fragile dune vegetation, the impact of shifting sands on built structures and paths, retention of existing trees, the extreme coastal environment and significant rainfall events were considered when designing and building the new camp sites and visitor infrastructure. Cape Range National Park offers visitors a range of outdoor recreation opportunities including hiking, snorkelling, swimming, walking, camping, canoeing, picnicking and fishing. Environment Minister Stephen Dawson said that during the last 15 years, visitor numbers to Cape Range National Park had increased substantially, reaching about 286,000 visits in 2016-17. "This growth has been largely due to the demand for nature-based tourism with more and more people keen to experience the world-renowned values of Ningaloo Reef first-hand," he said. "Not only does the Mesa campground provide additional facilities, it has been designed to ensure access for people with disability. "All paths, toilets and level hard ground camping bays are accessible to all."